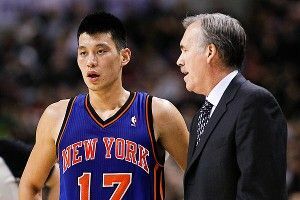 So far, the sensation of Linsanity has been about overlooked underdogs, seizing opportunities, and, yes, race. But undergirding every story trying to explain the meaning of Jeremy Lin is the game — basketball. So let’s take a quick peek at the Xs and Os. New York coach Mike D’Antoni has run the Knicks’ offense through Lin during their seven-game winning streak, and opposing defenses are starting to load up on Lin to stop the Knicks’ attack. In the second quarter of Wednesday’s game against the Sacramento Kings, D’Antoni used the defense’s focus on Lin to set up a beautiful lob to Landry Fields for an alley-oop. The play starts with Lin passing to Landry Fields on the wing. After making the pass, Lin cuts along the strong side and ends up right beneath the rim. Fields quickly reverses the ball to Amar’e Stoudemire, who popped out to the 3-point line. As this is happening, Lin comes off a pindown screen set by Steve Novak. As Lin cuts back toward the perimeter, Stoudemire dribbles at him and executes a handoff. 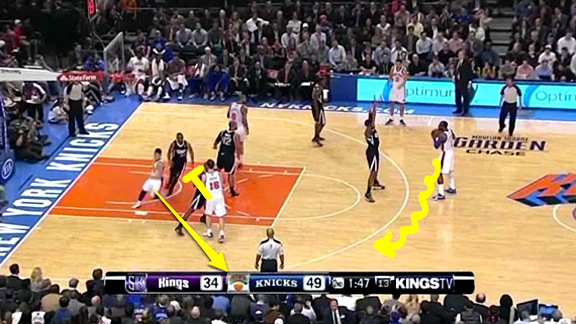 Stoudemire then holds his position, which acts as a screen for Lin. 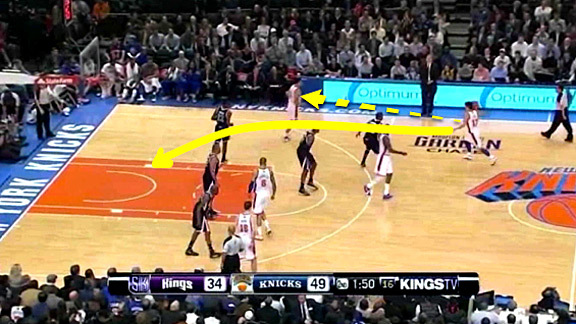 When Lin uses Novak’s screen, the Kings’ defense pays a lot of attention to him. All five Sacramento defenders watch Lin and prepare to react, and this opens up backdoor cuts and screens away from the ball. Tyson Chandler sets a screen for Fields to make a back cut along the baseline. Chandler’s defender, like everyone else, is watching Lin with the ball, so he doesn’t see Chandler setting the screen or call it out for his teammate. Fields’ defender runs into Chandler’s chest and Chandler’s defender fails to stop the pass or contest Landry’s finish because he is so focused on the ball. The defender’s reaction comes too late and he can’t do anything about Landry Fields jumping to slam the ball home. The play was a great call by D’Antoni, and his players executed it to perfection. Stoudemire set a good screen, Chandler and Fields didn’t give the play away too early, and Lin understood that even though there was a defender in the passing lane, that defender was too focused on him to stop the lob. 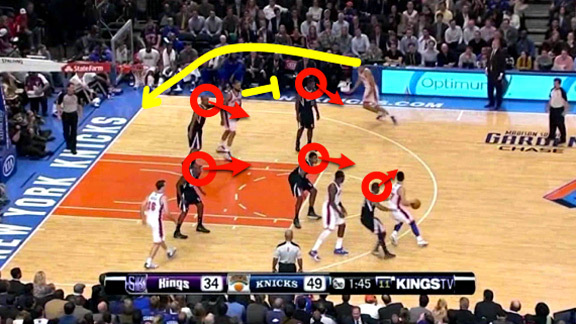 On this play, it wasn’t just the giddy Madison Square Garden crowd, but also the Kings’ defense that got caught up in Linsanity. 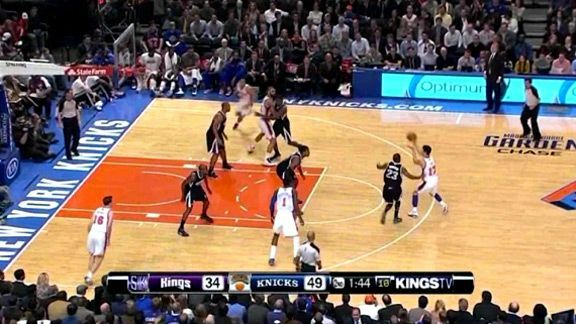 The Knicks identified the defensive lapse and took advantage of it with a spectacular play.